Another Most Important Election in Our History is done. Thank God for small favours. Once upon a time, broadcast legend Red Barber was asked what he thought about heavy hearts after a Florida State University football loss by one point. The man who suggested in the moment, on the air, that Brooklyn Dodger fans would get over losing the 1951 pennant playoff soon enough, compared to worse things happening elsewhere, didn’t flinch. “I was around the Ohio State-Notre Dame game in 1935,” said Barber, on one of his pleasant morning segments for twelve years worth of Fridays on NPR’s Morning Edition, “and the Bobby Thomson home run, and the Mickey Owen dropped third strike, and the Chicago Bears’ 73-0 win over the Redskins. And I saw the FSU-Miami one-point game. Well, then. As usual, the election now concluded (if you don’t count races too close to call as of midnight and, perhaps, some requiring recounts) was ballyhooed as The Most Important Election in Our History. As elections have been ballyhooed since not too long after the United States went from founding to living, breathing country. “The people’s pulse had been taken, charted, predicted, and catalogued. And they were told exactly whom they would elect, and by what majority. And yet—it couldn’t hurt to watch the campaign, anyhow.” That was Edward R. Murrow, in 1949, reviewing the 1948 elections for volume two of his documentary album I Can Hear It Now. Those elections were The Most Important Elections in Our History, too. That was then, this is now, and in terms of national elections there have been 31 Most Important Elections in Our History since, including the one just concluded. The people’s pulses were taken, charted, predicted, and catalogued for those, too, and they were told likewise whom they would elect and by what majority. And, yet, it hurt like hell a little more each time to watch them, anyhow. Right up until this one, which didn’t just hurt like hell, it felt like having been burned to the third degree with blow torches, from the commentaries which ejaculated as though the line between reason and mania was never once drawn to the relentless report of robocalling that seems to have allowed few households more than a half hour’s worth of peace before the next telephone ring. The practical results, of course, are that for all their fustian and all their handwringing and all their Gawdsaking (as in, H.G. Wells isolating the hysterical breed as “For gawdsakes let’s do something”) the political class, the commentariat, and those among we commoners to whom politics is the alpha and omega of human existence couldn’t stop Americans from deciding the least mischievious government for the next two years to come is divided government. The Republicans increased their Senate majority by the hair of their chinny chin chin. The Democrats took a House majority likewise. President Tweety may find himself thwarted a little more profoundly in the House than he was when it had a Republican majority that didn’t always ask “Which cliff?” when he hollered “Jump!” But if the Senate will check the House’s less reasonable assaults, there will be little either chamber can do to check the president’s less reasonable tweetstorms, falsehoods, self congratulations, or self exposures in Constitutional illiteracy. In a word, gridlock. And in a political climate that continues yet to uphold nothing more substantial than that the State is or should the be-all and end-all of life, nothing more profound than that there is simply no element of life that can or should be allowed to avoid political address, whether political address is either competent or Constitutionally sanctioned, gridlock is the outcome devoutly to be wished for so long as it lasts. And, in another few words, thank God the campaign is over at last. 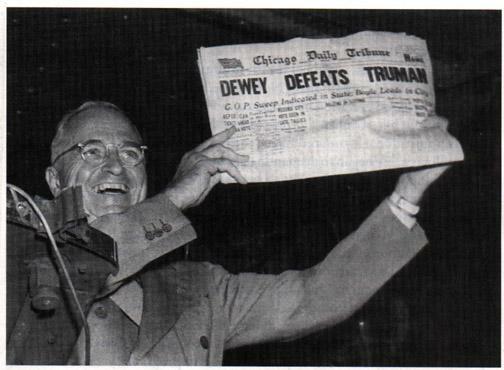 Campaigning today makes that of 1948 seem to have been watching a world-class World Series. (In case you wondered, in the actual 1948 World Series the Cleveland Indians defeated the Boston Braves. Not even the Chicago Tribune could misfire the headline for that one.) This year we saw a world-class World Series and yet another season of no-class politics, protest, punditry, and posturing. Bottom to top. Left to right. As if the sole legitimate response to any reminder that we stand on the shoulder of giants is to pee down their collars. You shudder when you imagine what the like of Tammany Hall, Franklin Roosevelt, the Prendergast machine which begat Harry Truman, Truman himself, Joseph McCarthy, Richard Daley, Lyndon Johnson, Richard Nixon, the Nassau County Republicans of the 1960s and 1970s, and Bill Clinton would have been in the Twitterverse, had there been a Twitterverse for them to navigate in those times. But some funny things happened the morning after The Latest Most Important Election in Our History. Yes, Mr. Barber of blessed memory, the sun rose right on time. The autumn flora continued doing what the autumn flora does. Likewise the fauna. The great Atlantic and Pacific Oceans continued bathing the coasts west and east, and the great rivers continued running. Americans continued having breakfast, going to school, going to work, appreciating God’s handiwork in nature and man’s in the arts, and volunteering in the aftermaths of natural disasters and cold blooded murders. As Cato Institute senior fellow Michael D. Tanner writes in National Review, tens of thousands of Americans continue working with and for the victims of Hurricane Michael; over a million dollars and counting continue reaching toward the families of the eleven murdered at Tree of Life Synagogue, and people from Pittsburgh’s Muslim community to thousands of Christians stand by those afflicted Jews. Tanner has another observation: Americans remain generous people. They contributed $410 billion to charity in 2017, a year in which over 77 million Americans also gave close to seven billion hours helping neighbours and others in need. Remarkably without concern for race, creed, colour, or political preference. They continue doing so. People such as the customers and neighbours of John Chhan—Cambodian refugee become Seal Beach, California donut proprietor—whom Tanner says are buying his entire day’s stock every day the better to get him home early to tend his homebound, aneurysm-stricken wife. When it comes to races, I’m more inspired by pennant races and those between the Road Runner and Wile E. Coyote. If you don’t count 1984 Detroit, the least civilised fans celebrating a World Series triumph simply don’t have penchants for breaking entire cities. And when Wile E. Coyote, Genius, blows himself up, smothers himself under yet another misfiring Acme trap, or ends up going over his umpteen millionth cliff, he hurts himself, not the country. And when it comes to people, I’m more inspired by volunteers, spiritually human empaths, and generous neighbours than by the chirping crickets and barking pets of the politicised (lack of?) class. There’ll be another Most Important Election in Our History to animate the crickets and pets soon enough, God help us. Real Americans know, of course, that the most important date to come for America is Wednesday, 13 February 2019. The day pitchers and catchers begin the annual exodus to spring training. Note: For those interested, there is a charming retrospective of Red Barber's twelve years worth of Friday morning conversations---over the final twelve years of Barber's life---in his NPR partner Bob Edwards' Fridays with Red: A Radio Friendship.---EA. Gridlock is good...far as this 'smaller government' Conservative is concerned. President Trump won reelection last night. Just dumb luck that the Republican Party gets to tag along. ...because I'd vote for him if he ran as a Democrat. I LOVE this article. No, I ADORE this article! I've spent the afternoon raking golden and red leaves from our back yard, enjoying the sunshine, and loving the silence of our phone. Life, in all it's beauty and sometimes pain, goes on. And as you have said, the American people continue to shine above others in generosity and compassion. This 'most important election in history' was nothing of the sort. Thanks for the beautifully written reminder. AND THANKS for mentioning the 1948 Cleveland Indians World Series victory over the Boston Braves. We Cleveland fans don't have a whole lot of victories to celebrate, so we enjoy reminiscing about those that occurred, even before our births. I enjoyed the silence of my phone, too, until about half an hour ago. That's when what I call my Gracie-how's-your-brother cousin rang in. (You know: ask him one question, he'll talk for 38 years or a metaphorical equivalent.) And it took me the usual 20 minutes to be done with him and his old-man-punk-sore-at-the-world act. You tell him you need to go and he takes it to mean he can rant his head off for another six minutes. Especially when it comes as always it does from our hearts, and not the compulsion and theft of the State. I suspect the Indians' time will come again in our lifetimes. I say that with authority, having actually seen my Mets, my Red Sox, and the Cubs and the Astros win World Series in my lifetime. And remember 13 February! Thank God there's more than one song with that title . . .
Hank Mobley, "The Morning After"
Better indeed. I still have the earworm I gave myself this morning, dammit. I hate earworms, even more when I do it to myself. No, but thanks for helping me knock down an earworm! Ironically Leslie Nielsen was in both Airplane! and The Poseidon Adventure. If'n youse guys are going to derail my pleasant thread, at least do it with Leslie Nielsen's best work . . .
Police Squad was like the TV version of Stevie Ray Vaughn. Cut down at the prime of its life. Excellent editorial @EasyAce Thank you for the ping. These days, I'm becoming convinced that no matter who wins or who loses, life will go on and that it doesn't matter who is in power. I survived the hell that was the Obama administration. I was hoping for something more like heaven, but I'll settle for the purgatory we are in now. Life is never going to be 100% wonderful. There will be good times and bad times. We will all survive -- that is, until our Maker pulls the plug. Yesterday, a dear friend of mine insisted on taking me to vote, then to an appointment for bloodwork, then to lunch at Boston Market. At first, I told her she really didn't have to do this -- after all, she had taken me to breakfast the day before -- but she insisted. She has it in her mind that walking a half mile in a mild drizzle to the polling place is going to kill me. And she thinks I can't get to the lab by myself. But I'm glad I gave in. Spending some time with a really wonderful friend is one of my life's pleasures. And after so many months -- maybe a year or more -- of unrelenting negative campaigning and tons of junk mail (campaign literature), and fights with other supposed conservatives over what was really an awful spate of Republican and Democrat candidates, none of whom was worth voting for, I needed that fun time with my dear friend. I agree -- there was nothing particularly awesome about this election. Tne masive gridlock in Washington will continue as it always has and nothing beneficial to us citizens will really get done as usual. So we soldier on, do the best we can with what we have and along the way savor whatever pleasures life gives us. Stupid network execs killed it after a handful of episodes. The show was resurrected in the Naked Gun movies which were wildly successful. I believe Leslie Neilsen became an "overnight star" with the Naked Gun movies -- after toiling for years in numerous old tv shows, often playing bad guys in westerns. As to Police Squad, I loved how the special guest star in each episode was killed during the opening credits. I guess network execs didn't get the show's quirky humor. I always thought that his best work was "Swamp Fox." And remember . . . only 98 days until pitchers and catchers begin to report! Unfortunately, the Naked Gun films weren't half as funny as the original Police Squad! But then the Addams Family films didn't hold a candle to the original TV series, either. I think that kind of comedy is best doled out on 1/2 hour doses. Depends on the comedy. In the old-time radio era Fred Allen was quite successful going an hour each week, from 1934-39 as Town Hall Tonight (CBS), 1939-1940 as The Fred Allen Show (NBC; a sponsorship change necessitated the name change, which Allen wasn't exactly happy about), and 1940-42 as Texaco Star Theater. (CBS.) He inserted a very few music segments into a striking comedy hour that included some of radio's earliest news satires ("The Town Hall News! Sees nothing, says all!" ---it became "The Texaco News March of Trivia!" when Texaco took him on) and sketches by his cast known as the Mighty Allen Art Players. And the show which gave the first regular weekly exposure to Edgar Bergen and Charlie McCarthy was born as The Chase and Sanborn Hour and stayed that way for about four years before Bergen and McCarthy moved to a half-hour format. Allen assented to the half-hour change in Texaco Star Theater kicking and screaming---it was the combined idea of CBS and his sponsor. Later, he took a year's absence from the air for the sake of his health and returned in 1945 with The Fred Allen Show on NBC, which was basically his Texaco Star Theater half hour but with a slightly revamped "Allen's Alley"---here at last came Senator Claghorn. (Don't be shocked at the network changes; network jumpings by a lot of radio stars were as common as sneaking commercials into the scripts in those days.) When Allen left as a full-time radio host in 1949, it was more for the sake of his health than his ratings getting knocked down by game shows; NBC wanted him back but his doctors advised him not to work so hard anymore. He became a frequent guest on NBC's splashy bid to revive large radio variety shows, the ninety-minute The Big Show from 1950-52 hosted by [of all people] Tallulah Bankhead, and did other things on radio and television that didn't require him to carry the ball, particularly his time as one of the original panelists of What's My Line until---with his second memoir (Much Ado About Me) 7/8ths finished (the first, Treadmill to Oblivion, was for a long time the best-selling book to come out of classic network radio), he suffered a fatal heart attack while having a walk not far from his New York City home. And some of the greatest films ever made were comedies that ran for an hour and a half. Page created in 2.284 seconds with 21 queries.